Yeah! 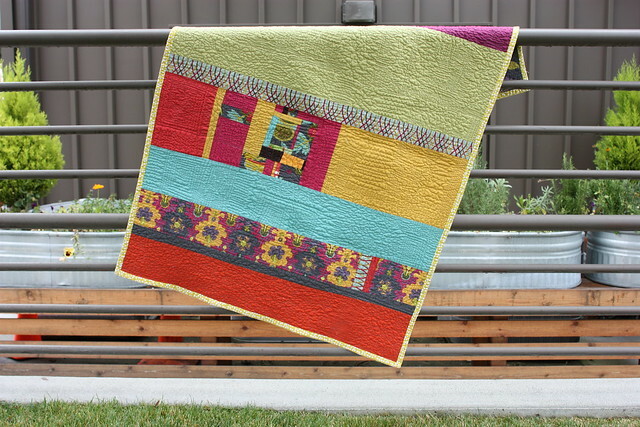 I completed the Lucky Improv quilt which started at Quiltcon in Denyse Schmidt’s Improvisational Patchwork Workshop. You’ve seen the progress here on the blog, from quilt blocks, to quilt top and finished back. 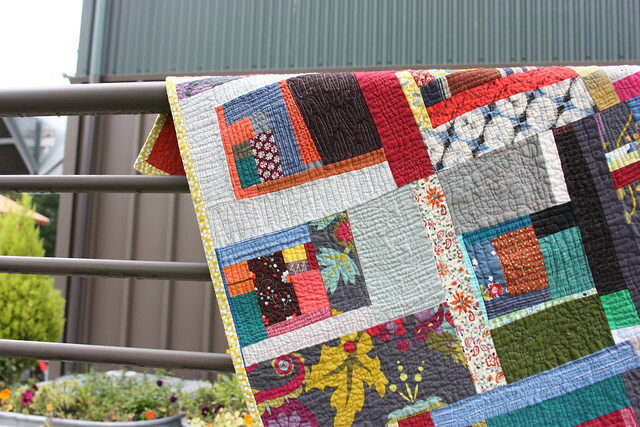 I was amazed at how the quilting changed every preconceived idea I had about the quilt. Each of the fabrics came alive after quilting. 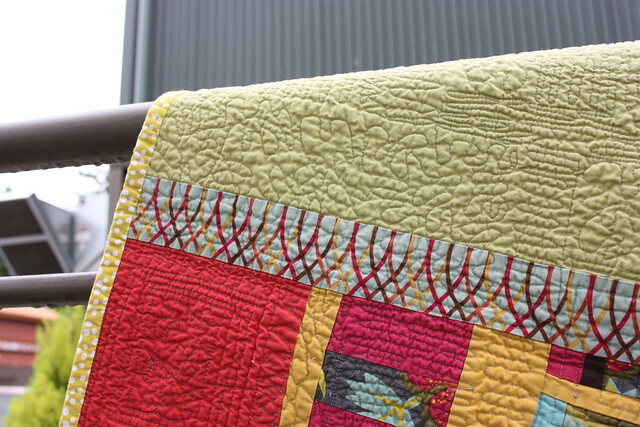 Many different patterns were used in the quilting process, from simple wavy lines to stippling. The best part was quilting the wide border at each end, which uses a floral pattern that Angela Walters taught in a Free Motion Quilting class at Quiltcon. By the end of the quilt I felt competent enough in my free motion skill to give it a try. I’m hooked on Free Motion Quilting now. The uneven lines and imperfections just add to the whole rustic, random, wonkiness of the quilt design. Toward the end of the quilt my designs were getting a bit more controlled and my confidence was building. I found the groove, which is a combination of peddle speed and hand speed or hand ,eye, foot coordination. Once the peddle and hands find the right balance the quilting flows evenly. What an exhilarating process! I can’t wait to complete another quilt just to be able work on the quilting. The finished size ended up at 36″ x 49″. Yes, I used my regular old sewing machine and a spool of 50 weight Medium Grey Aurifil thread, on the quilting. Beautiful! 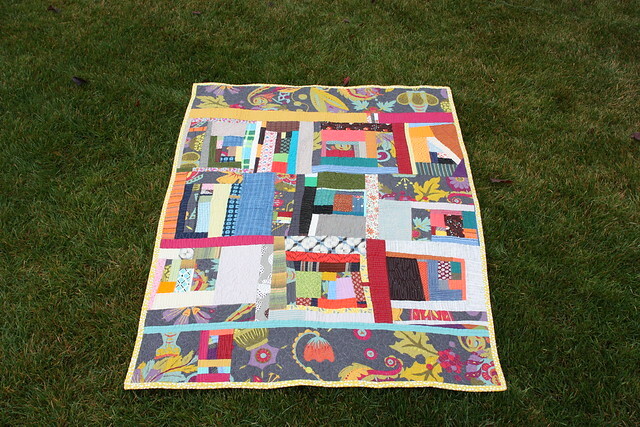 I love all the different quilting lines and all the different fabric choices. love this quilt! 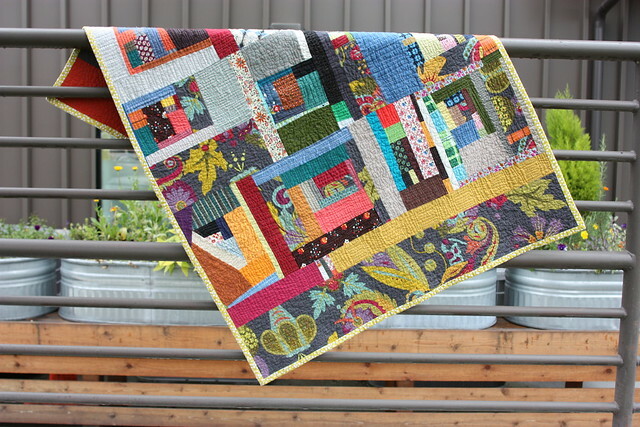 I’ve never tried inprov quilting and FMQ scares me, but this has totally inspired me! The borders are wonderful too! LOVE this quilt!! Inspired to get out some fabric and start on my own tonight! Thanks for sharing. This is fabulous! I love your quilting and choice of fabrics. Diana, I love it! You really did a great job! I need to get my blocks from that class out and do something with them! i love it. the colors are fab! wow i have worked on one improv. it was harder than i thought but i’m a traditional quilter. so out of the box for me! i need to do another one. and make it small enough to quilt myself! Diana just love the quilt you made. I would have loved to attend the workshop it looked like so much fun. Wow. 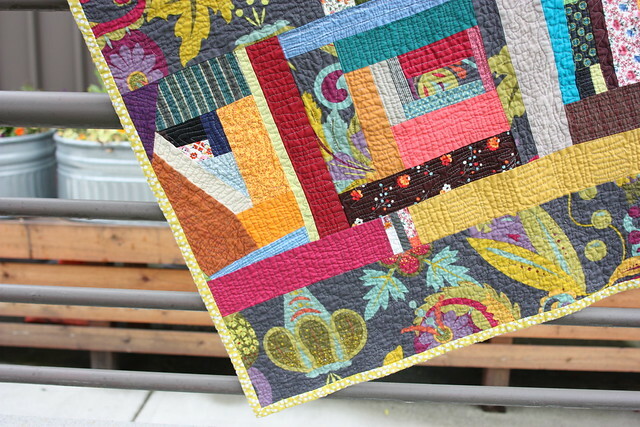 I especially love the way the inspiration fabric is “woven” through the quilt. Thank you so much for taking us along for the creative journey. Congratulations on a beautiful quilt. in a way this reminds me of a gees bend quilt. the quilting does add another dimension, great job!